Yeah, some sort of switch seems to get flipped when one enters their 30’s, or, at least it did for me. I feel like the bulk of my crotchetiness comes from being responsible for my own home, though — when you put your time, money and effort into it, things change. However, I also have zero patience for lots of other things that never previously crossed my mind in my younger years. Quite often, I feel like a baby boomer with my thoughts of technological overkill and decreased human interaction and longing to return to a more simplistic, wholesome way of life/living when people had MANNERS and common courtesy. (Do people even know anymore what the words “thank you” are USED for?) I was by NO means raised in a Leave It To Beaver household, but the older I get, the more I find myself somehow relating to it and wishing everyone WAS raised like that. I don’t want people living like the Amish nor do I advocate conformity or having a 1950’s mentality, but some basic manners would be nice. Would it kill people to be remotely courteous (and use proper grammar)? 🙂 End Rant. LOL Clearly, you’re not alone in your (ocassional) crotchetiness. Is this just a female thing? My SO is completely unbothered by ANYthing, but, he’s alarmingly oblivious to the world around him. Does Chris echo your sentiments? Yeah, I have my theories about technology too. Mostly involving Facebook. I think Facebook has turned us all into narcissists. The constant selfies, the humblebrags, the not-so-humble-brags, the inability to do ANYTHING without sharing it with the world (I swear, some people seem to think that life isn’t happening unless they’re documenting it all online). Then we take this narcissism and start applying it everywhere. Everyone needs to cater to me! I am a princess! The world revolves around meeeeee! It’s so gross. And yeah, Chris is a lot less bothered by all this stuff than I am. And honestly, I don’t really know why it bothers me so much either. On top of FB (which is, yes, promoting narcissism through and through), you have the whole Internet for people to hide behind, turning seemingly innocuous individuals into obnoxious, busy body bullies, commenting unsolicitedly about anything and EVERYthing. People are, apparently, wholly incapable of sharing thoughts and opinions in a respectful manner, without resorting to name calling or insulting a complete stranger two sentences into a response for having a different POV. They seem to think a differing of opinions is a personal attack on them. ?? That and people are seemingly becoming less and less tolerant of others beliefs. You don’t need to AGREE with or even understand everything someone says but respect it. It’s sort of what you were saying in a previous comment about people making comments on the ingredients you use (that they don’t eat). . .Just do your own thing, shut up about someone else’s and acknowledge you have different ways of living. PS When I said being responsible for a home is mostly what makes me crotchety, I didn’t mean that the RESPONSBILITY made me cranky just that I’m often yelling at MY neighborhood kids (and various delivery people 🙂 ) in an effort to preserve everything I’ve done for my home. If I lived in an apt., I wouldn’t give a crap. 🙂 AND be slightly less cantankerous. Yup, spot on–it’s the combination of that anonymity + the self-centered idea that anyone who doesn’t agree with you is wrong that makes the internet such an icky place sometimes. Politics and religion are always contentious topics, but how food ended up in the mix too, I’ll never understand. But WHOA do people get crazy about food. Once I tried a rubberband bracelet to train myself not to say ‘like’ all the time. I ended up with welts all over my wrist and I didn’t say ‘like’ any less. Bummer. HAAAAAA! Andy Roony! Chasing kids with brooms! I want to move into the house next to you and we can be crotchety together and tell the people who are taking pictures of themselves inside their car to just. stop. and then we can uninvent hashtags. I like the way this is sounding. SLOPPY LENTILS! YUM! Why do people take pictures of themselves in their cars?! WHY? What is UP with THAT? It’s always to illustrate some status update that absolutely does not need illustrating. Like, “On my way to work.” Or “I’m really happy tomorrow is Friday.” There is no need to post a car selfie for this! GAWD! I made something similar last week. It was so good. Lentils have a great texture and flavor! It was messy and sloppy and delicious. 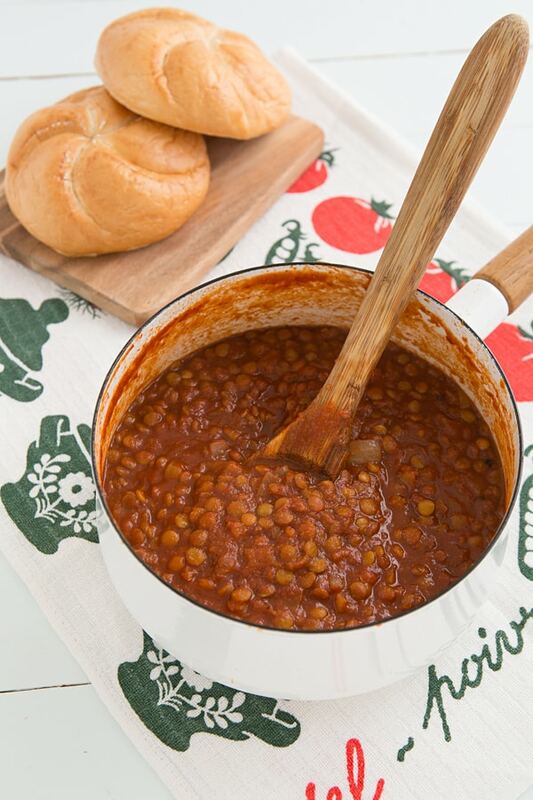 I love lentils–if I had to choose one vegetarian protein as my favorite, it would definitely be lentils! lately i have been feeling that way too and I complain the weather and my lack of vitamin D.. i try to eat more plant based diet and cant do those fake meat stuff. I really appreciate recipes like this one using wholesome ingredients 🙂 🙂 pinning it. Thank you for the pin! I’ve been complaining about the weather a lot too lately–there’s nothing worse than freezing rain! Complaining is underrated. These sloppy lentil joes look delicious. Is the molasses a deal breaker or do you think I could leave it out or sub something for it? Ya know what makes sloppy joes even more awesome? Putting potato chips on them…do it. No! You can leave it out. 🙂 In fact, the first few times I tested this recipe, I made it without the molasses. It’s still really tasty, but my mom always made sloppy joes that were more on the sweet side, so adding that tablespoon of molasses made it taste closer to the version I’m used to. Crotchety or cynical? Who gets to decide at what age we start acting that way? Andy Rooney, oh how I miss him. He was always right on the money. Anyhoo – question about the bread…how do you prevent it from becoming soggy before you finish eating it? I have an aversion to soggy bread (unless it’s floating in onion soup). You are so creative! The sauce will be fantastic to go with spaghetti instead of meat sauce. Thank you! 🙂 I hope you like the recipe! I loved it as it was the best home made sloppy recipe I’ve ever eaten! What a treat! My husband the carnivore also loved it! Definitely going into the permanent recipe box!! Thanks again! “Sloppy Lenny’s” are also great scooped up with tortilla chips instead of hamburger buns! When we went sledding one winter I packed a tailgate lunch. I kept them hot in a big thermos and ladled them into individual bags of Frito’s then sprinkled shredded cheddar & sliced scallions on top then we dug in with spoons. The kids loved it! What kid doesn’t like lentils?! What kind of kids are you raising over there?! 🙂 I have been in a mood for 2 days now. Maybe I need to take up kickboxing or something. Are you kidding? My kids complain when we have pizza! What kid doesn’t like pizza?! Pretty much the only thing that passes muster is mac & cheese – from a box. Seems like I’m cranky too – we need to do some boxing! I didn’t like pizza! For years, I would only eat the crust. My family would eat dinner, leave me the crust ends, and then I’d eat. But hey, look, I turned out fine! Ish. Fine-ish. 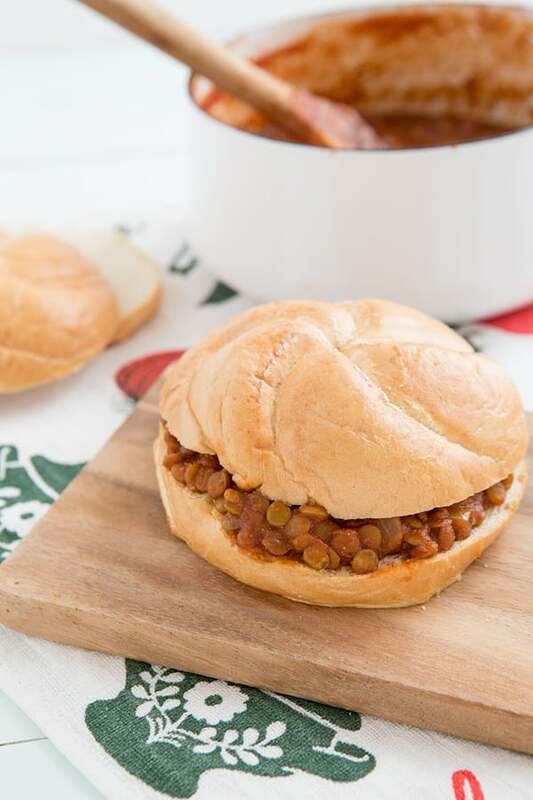 Sloppy lentils is perfect for winter. Thank you so much for posting so many plant-based recipes -good for our health and our beautiful planet Earth. Ha, I totally know the feeling. Most of my complaining is aimed at the ‘young people’ these days which makes me feel properly ancient. I had to make a comment about Narcissism – Which has been the root of all evil in my life almost every woman in my family has it – except for me no contact, no contact, no contact is the only way to heal from this and most people id say don’t realize that Munchausen by proxy, and obsessive compulsive disorder is also another disorder of the mind that SOME TRUE narcissist have. To bad most narcissist don’t realize they have it . The underlying dehumanization of this is traumatizing to any child that are under the care of these monsters. Recovering for life from this. Now you no why I said in my earlier post , I just want to be left alone. Have a positive day ! Yes, sometimes I think cutting contact is the best thing you can do. We’re always told that blood is thicker than water, but I don’t think that’s always the case. I’m sorry to hear you’ve had to grow up dealing with that! Your a awesome Veghead … See after reading about me your hardly cranky anymore …lol . I used to love making sloppy joes in Peace Corps. This makes me want to try it again! The almost meatiness of meat substitutes makes me gag. That’s how I know I was truly meant to be a vegetarian. We should complain together! I’ll complain about wedding planning and you can complain about hashtags. It’ll be awesome. And we’ll eat sloppy joes. Mmm. YES! Ugh. The only meat subs I really enjoy are Field Roast, but probably because they’re more about imitating the form and savoriness rather than imitating the exact flavor. So we can complain about meat substitutes too! Oh no, I could have complained a lot more. I could have gone into great detail about why car selfies are so wrong, you see. But I restrained myself! Love the colorful writing in this post! And I’m always a fan of BBQ/sloppy joe meat-free meals. Sounds great, and hope to make this soon! I love this! It’s perfect comfort food for a cold winter day. Definitely making! I hate this post! I shake my broom at it! 😉 Actually my broom is one of those flat-headed dry mops so the end would just flop about and it wouldn’t have the same impact, so I’ve changed my mind. I actually love this post. You and your eyebrows crack me up. I tried lentilizing Sloppy Joes awhile back and they were, like, sugary sweet. I was so disenchanted with my first attempt that I didn’t go back and try again. Now I don’t have to! Shaking a Swiffer just isn’t the same, isn’t it? It doesn’t make that menacing bristle-y noise.